Judge Blocks Kansas' Proof-Of-Citizenship Voting Registration Requirement : The Two-Way The ruling is the latest development in a back-and-forth over the registration requirement, which supporters claim prevents voter fraud and opponents say is an effort to suppress voting rights. 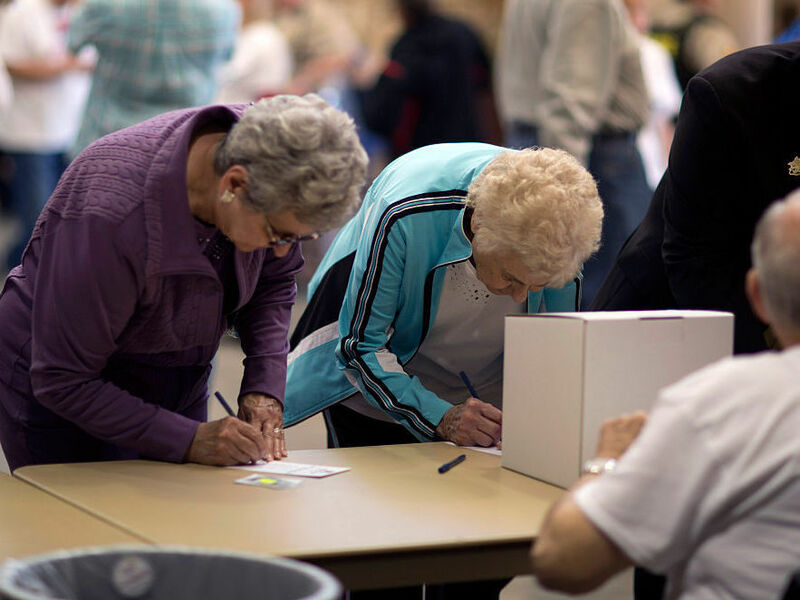 Two women cast their ballots for Republican candidates during the state's Republican caucuses on March 5 in Wichita, Kan. In the latest development in a long-standing disagreement between Kansas election officials and the federal Election Assistance Commission, a judge in Kansas has ruled that the state can't require people to show proof of U.S. citizenship when registering to vote at a motor vehicle office. According to court documents, U.S. District Judge Julie Robinson ruled Tuesday that Kansas' proof-of-citizenship requirement violates a provision of the National Voter Registration Act that requires "only the minimum amount of information" to determine a voter's eligibility. Robinson's decision means that Kansas must register thousands of voters whose paperwork was on hold because they did not show proof of citizenship. Her decision, however, will not take effect until the end of the month in order to give the state time to appeal, the Associated Press reports, which adds that the state intends to do so. The ruling is the most recent move in a back-and-forth over the proof-of-citizenship requirement, but it isn't the first time a judge has ruled Kansas can't ask would-be voters for proof of citizenship. As NPR's Pam Fessler reported in February, "A state judge ruled that Kansas Secretary of State Kris Kobach could not enforce the proof-of-citizenship requirement for those who use the federal [voter registration] form." But then, the EAC's executive director, Brian Newby — who is a former county elections official in Kansas — stated in a letter that the agency had "updated the instructions on filling out that federal form to include the proof-of-citizenship requirement for Kansas residents," Pam reported. Newby's action came after "previous EAC executive directors had refused to add the requirement," she said. "[Newby's letter] led one of the EAC's three commissioners — Thomas Hicks, the only Democratic appointee — to issue a highly unusual statement Tuesday calling for Newby's letter to be withdrawn. He said it 'contradicts policy and precedent previously established by this commission,' and he called on the commission to review the matter in a public forum. "For his part, Newby told NPR that he believes it's within his power to make changes to the instructions that accompany the federal voter registration form, in response to a state's request. But he said that 'any interested party' can ask the commission to review his decision.
" 'The decision isn't final,' he said. 'This started a process.' "
Now, unless a higher court stays U.S. District Judge Robinson's injunction against the proof-of-citizenship requirement, it would take effect after May 31, effectively clearing the way for the people whose voter registrations are currently in limbo to vote in the 2016 federal elections. Kobach, Kansas' secretary of state, has argued that — in order to prevent voter fraud — people who cannot produce a birth certificate or other document showing U.S. citizenship should not be able to vote. "The evidence shows only three instances in Kansas where non-citizens voted in a federal election between 1995 and 2013, and about 14 non-citizens attempted to register during that time. The court noted the 'magnitude of harm' caused by 18,372 applicants at motor vehicle offices who were denied registration due to the state's proof-of-citizenship law." In her decision, Robinson wrote that "even if instances of non-citizens voting cause indirect voter disenfranchisement by diluting the votes of citizens, such instances pale in comparison to the number of qualified citizens who have been disenfranchised by this law." The American Civil Liberties Union praised the decision. "This ruling lifts the barrier that the state illegally imposed on Kansans who were trying to register to vote," Dale Ho, director of the ACLU's Voting Rights Project, said in a statement. "It means thousands of people who could have been sidelined during the upcoming primary and general election will be able to participate."